NETWORK FINALS: BULL gained 0.1 in final numbers. CABLE HIGHLIGHTS: History’s CURSE OF OAK ISLAND returned from holiday break to lead Tuesday cable at 0.84, and lead-out HUNTING HITLER was at 0.47. USA’s WWE SMACKDOWN was steady at 0.82. On HGTV, FIXER UPPER returned at 0.66, followed by the new RESTORED BY THE FORDS at 0.44, and HOUSE HUNTERS at 0.32. 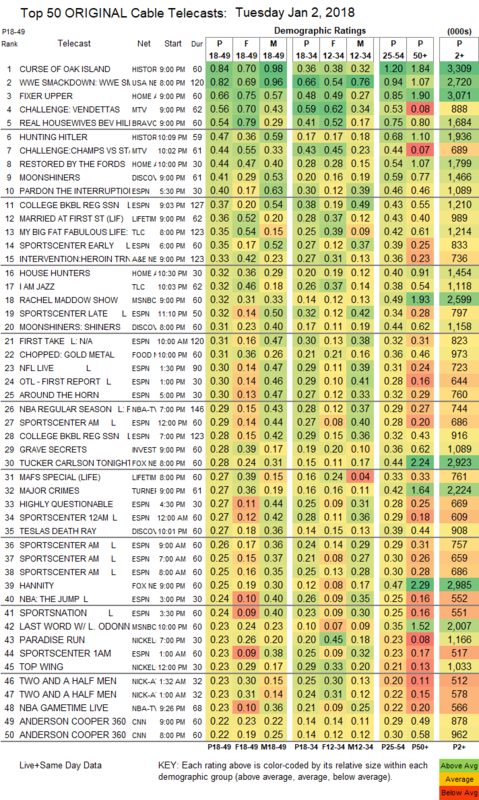 MTV’s THE CHALLENGE returned at 0.56, with another lead-out hour at 0.44. On Bravo, REAL HOUSEWIVES OF BEVERLY HILLS lost 0.03 to 0.54, and STRIPPED was at 0.22. Discovery’s MOONSHINERS dipped 0.05 to 0.41, with a lead-in hour at 0.31, and lead-out TESLA’S DEATH RAY at 0.27. A COLLEGE BASKETBALL game on ESPN was at 0.37. 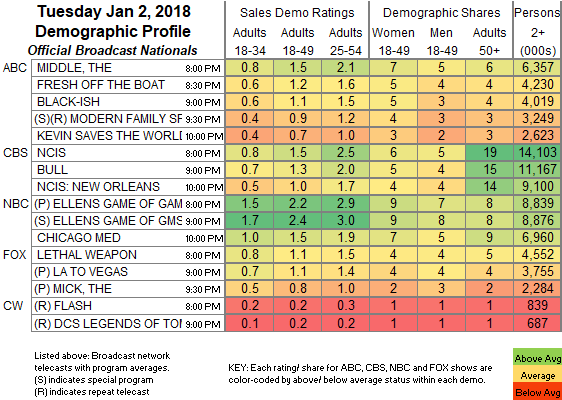 On Lifetime, MARRIED AT FIRST SIGHT had its official season premiere at 0.36, after a lead-in hour at 0.27 and lead-out half-hours at 0.21/0.13. On TLC, the season premiere of MY BIG FAT FABULOUS LIFE was at 0.35, and the season premiere of I AM JAZZ was at 0.32. A&E’s INTERVENTION returned at 0.33. MSNBC’s RACHEL MADDOW SHOW led cable news at 0.32/0.49/2.6M, ahead of Fox News’s TUCKER CARLSON TONIGHT at 0.28/0.44/2.9M and CNN’s ANDERSON COOPER 360 at 0.22/0.29/900K. Food Network’s CHOPPED ticked up to 0.31. On ID, GRAVE SECRETS slipped 0.02 to 0.28. TNT’s MAJOR CRIMES was at 0.27, compared to last week’s 0.31/0.27. TV Land’s TEACHERS was at 0.11. "Could you post numbers for FOOD's '30 Minute Meals' (noon), please? Thanks." "MADONNA MEDELLIN VIDEO also aired on MTV2 at the same time. Do you have numbers? Thanks"
"Gone on WGN numbers, please."